Waste to Energy in Düsseldorf. for a clean city. 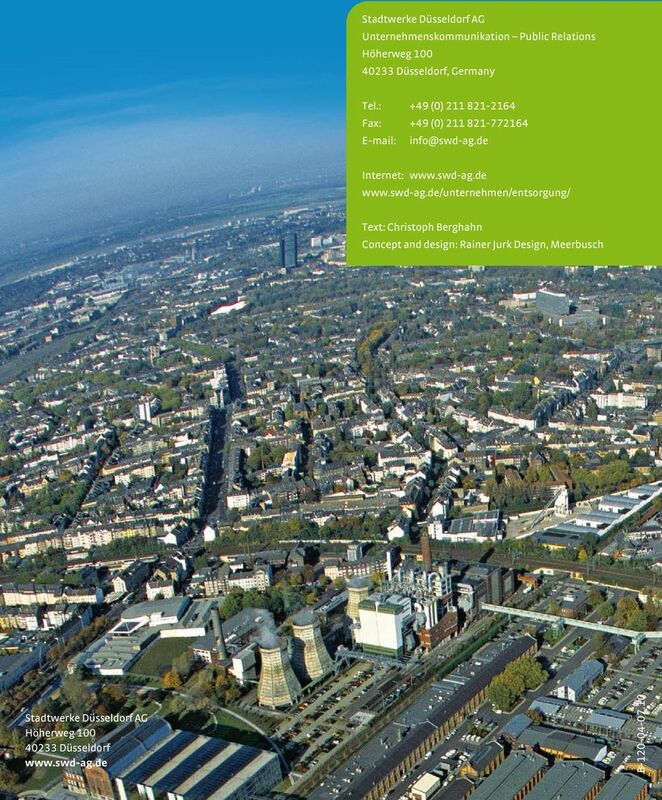 Download "Waste to Energy in Düsseldorf. for a clean city." 1 Waste to Energy in Düsseldorf for a clean city. 2 Waste Management in Düsseldorf. 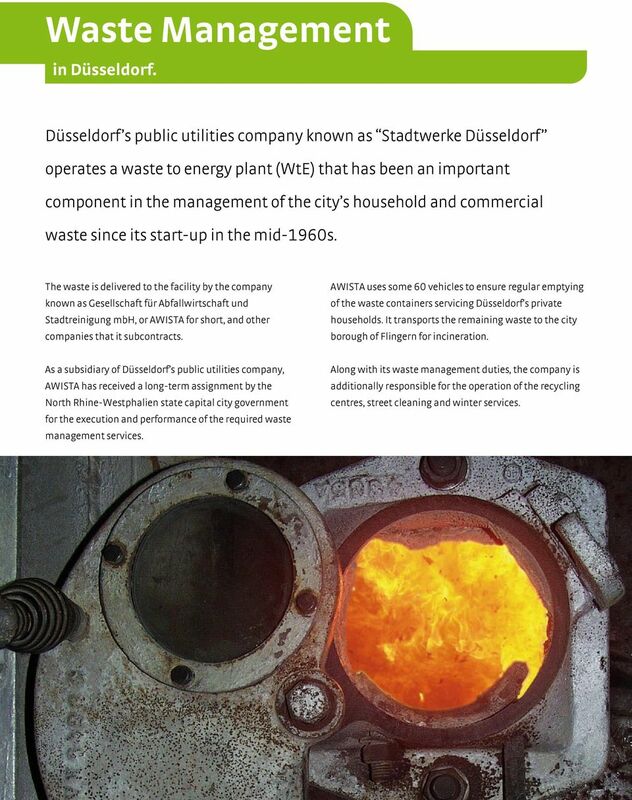 Düsseldorf s public utilities company known as Stadtwerke Düsseldorf operates a waste to energy plant (WtE) that has been an important component in the management of the city s household and commercial waste since its start-up in the mid-1960s. The waste is delivered to the facility by the company known as Gesellschaft für Abfallwirtschaft und Stadtreinigung mbh, or AWISTA for short, and other companies that it subcontracts. AWISTA uses some 60 vehicles to ensure regular emptying of the waste containers servicing Düsseldorf s private households. It transports the remaining waste to the city borough of Flingern for incineration. As a subsidiary of Düsseldorf s public utilities company, AWISTA has received a long-term assignment by the North Rhine-Westphalien state capital city government for the execution and performance of the required waste management services. Along with its waste management duties, the company is additionally responsible for the operation of the recycling centres, street cleaning and winter services. 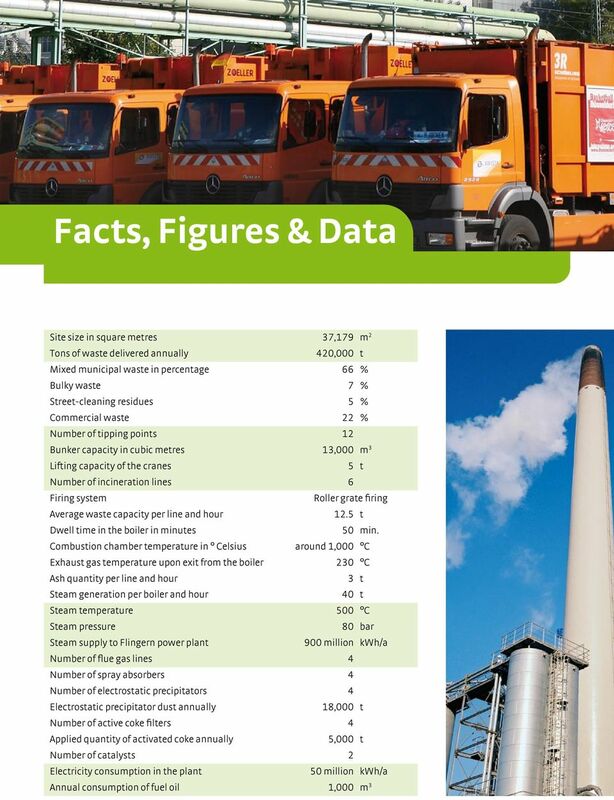 3 History of the WtE Stadtwerke Düsseldorf has operated the waste to energy plant in Düsseldorf since In 1999 Stadtwerke took over the ownership of the facility, which treats of some 450,000 tons of residual waste annually in an environmentally-friendly fashion. The WtE facility works together jointly with the power station located nearby in Flingern. 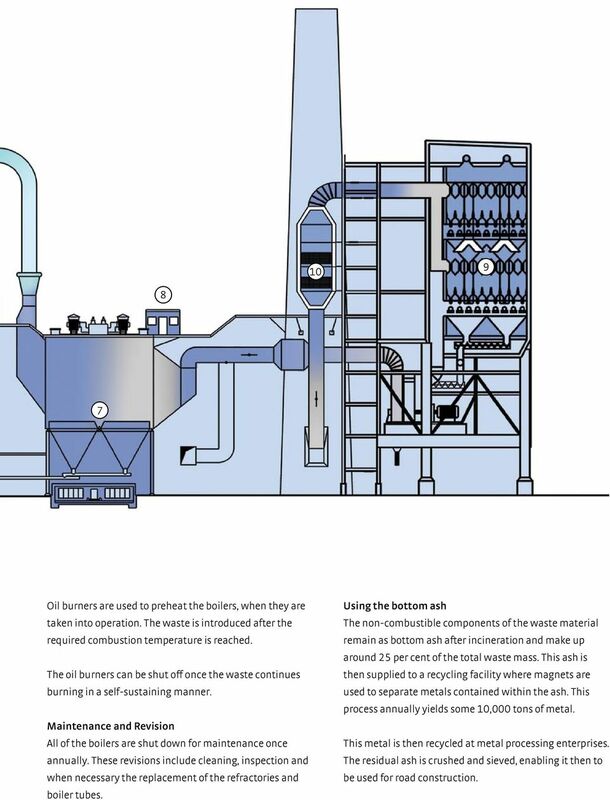 The energy released in the WtE during incineration is delivered to the power station in the form of superheated steam where it is efficiently used for the generation of electricity and district heating. 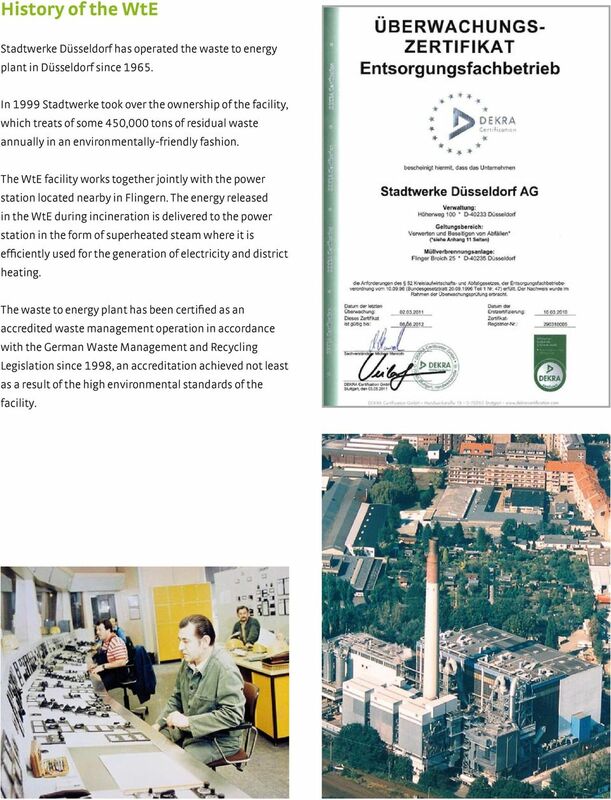 The waste to energy plant has been certified as an accredited waste management operation in accordance with the German Waste Management and Recycling Legislation since 1998, an accreditation achieved not least as a result of the high environmental standards of the facility. 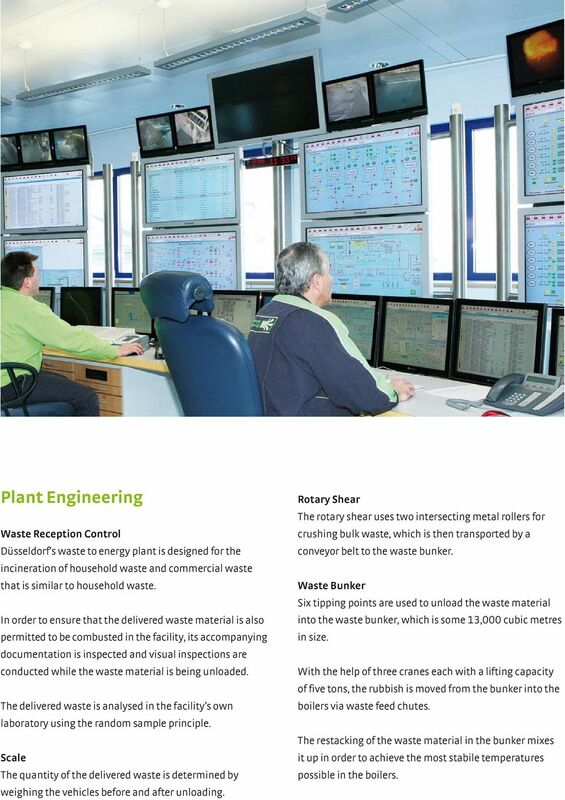 4 Plant Engineering Waste Reception Control Düsseldorf s waste to energy plant is designed for the incineration of household waste and commercial waste that is similar to household waste. In order to ensure that the delivered waste material is also permitted to be combusted in the facility, its accompanying documentation is inspected and visual inspections are conducted while the waste material is being unloaded. The delivered waste is analysed in the facility s own laboratory using the random sample principle. Scale The quantity of the delivered waste is determined by weighing the vehicles before and after unloading. Rotary Shear The rotary shear uses two intersecting metal rollers for crushing bulk waste, which is then transported by a conveyor belt to the waste bunker. Waste Bunker Six tipping points are used to unload the waste material into the waste bunker, which is some 13,000 cubic metres in size. 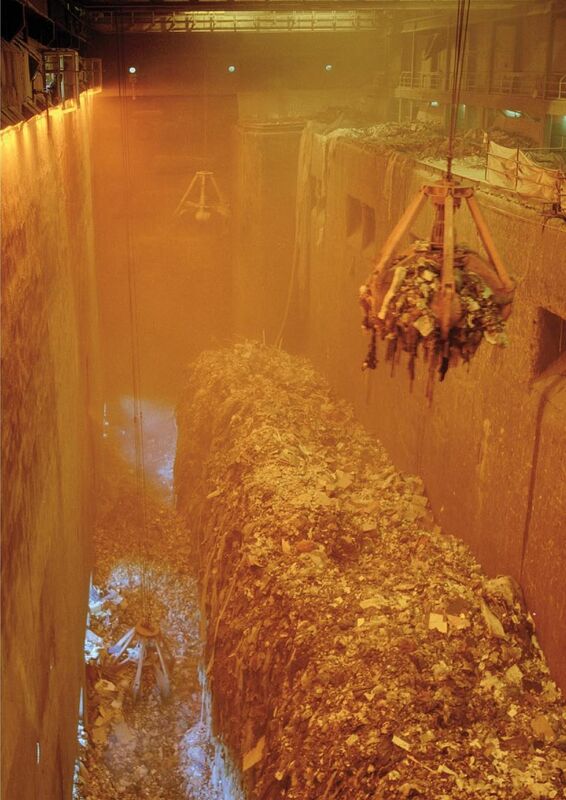 With the help of three cranes each with a lifting capacity of five tons, the rubbish is moved from the bunker into the boilers via waste feed chutes. The restacking of the waste material in the bunker mixes it up in order to achieve the most stabile temperatures possible in the boilers. 6 Overview of the Facility Cross-section of Düsseldorf s waste to energy plant 1 Waste bunker 2 Waste feed chute 3 Roller grate firing 4 Vertical boiler 5 Tube bundle 6 Spray absorber 7 Electrostatic precipitator 8 Emission measurements 9 Coke filter 10 Catalyst Waste feed-in 800 C 4 Vaporizer 780 C 470 C 465 C 5 6 1,020 C 2 Air 1,200 C C 1 Air 230 C Flue gas for cleaning Air Bottom ash Combustion grate The six boilers at the facility work on the basis of the process developed by Stadtwerke Düsseldorf that is known as roller grate firing. This process is known throughout the world today as System Düsseldorf and is used in around half of all the world s waste incineration plants. The waste material is moved downwards by six metal rollers in a staircase-shaped arrangement and transported through the combustion chamber. 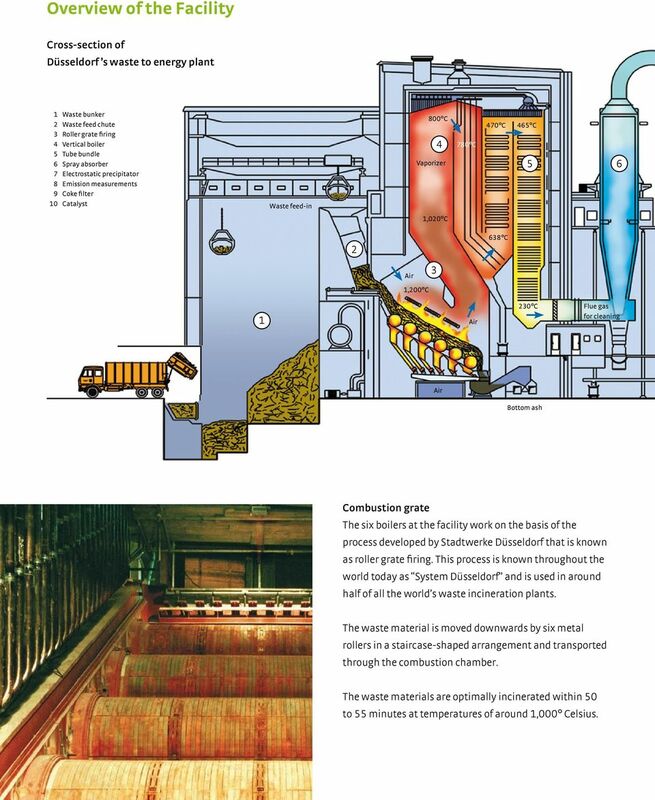 The waste materials are optimally incinerated within 50 to 55 minutes at temperatures of around 1,000 Celsius. 7 Oil burners are used to preheat the boilers, when they are taken into operation. The waste is introduced after the required combustion temperature is reached. The oil burners can be shut off once the waste continues burning in a self-sustaining manner. Maintenance and Revision All of the boilers are shut down for maintenance once annually. These revisions include cleaning, inspection and when necessary the replacement of the refractories and boiler tubes. Using the bottom ash The non-combustible components of the waste material remain as bottom ash after incineration and make up around 25 per cent of the total waste mass. This ash is then supplied to a recycling facility where magnets are used to separate metals contained within the ash. This process annually yields some 10,000 tons of metal. This metal is then recycled at metal processing enterprises. The residual ash is crushed and sieved, enabling it then to be used for road construction. 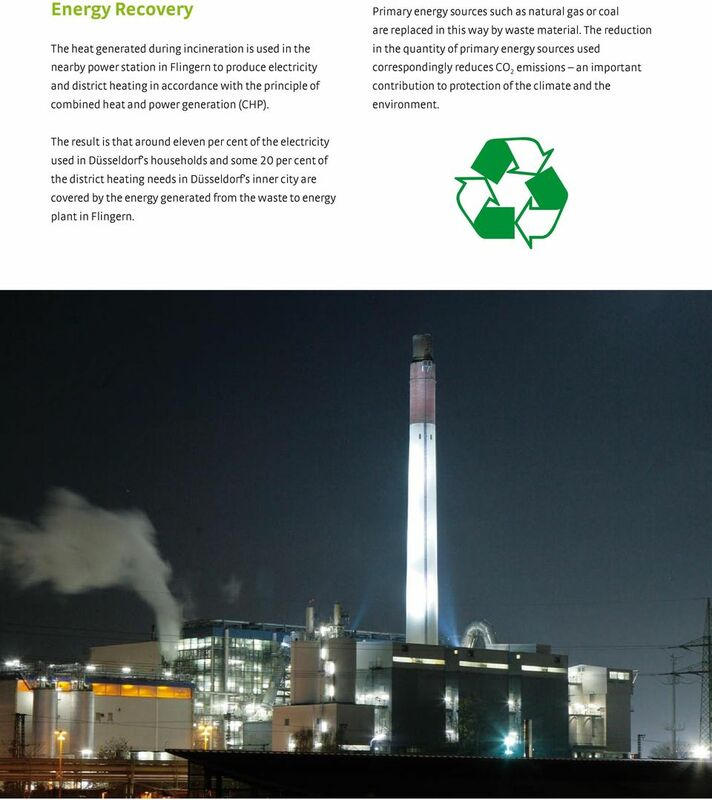 8 Energy Recovery The heat generated during incineration is used in the nearby power station in Flingern to produce electricity and district heating in accordance with the principle of combined heat and power generation (CHP). Primary energy sources such as natural gas or coal are replaced in this way by waste material. The reduction in the quantity of primary energy sources used correspondingly reduces CO 2 emissions an important contribution to protection of the climate and the environment. 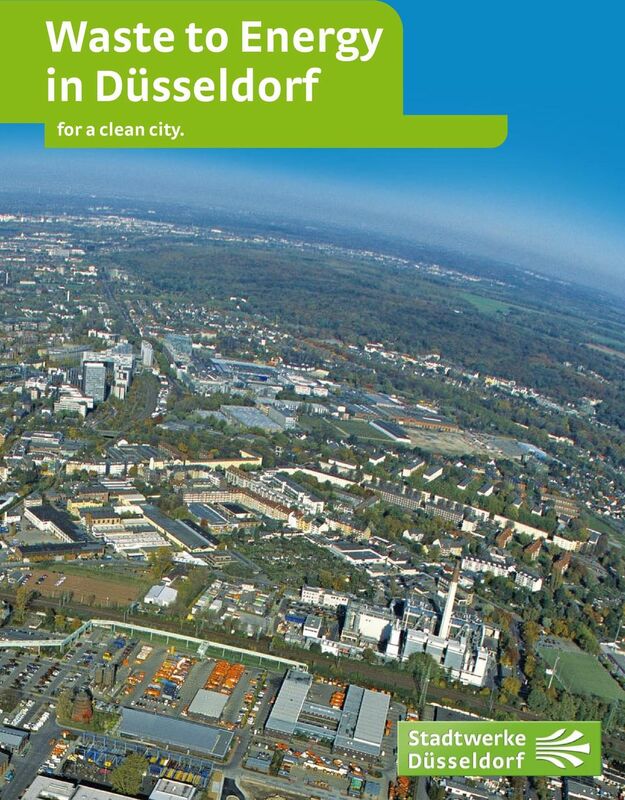 The result is that around eleven per cent of the electricity used in Düsseldorf s households and some 20 per cent of the district heating needs in Düsseldorf s inner city are covered by the energy generated from the waste to energy plant in Flingern. 9 Flue Gas Cleaning In order to maintain clean air, Düsseldorf s waste to energy plant is equipped with a four-stage system for cleaning the flue gases. Initially, the hot flue gases are sprayed with lime milk. Sulphur, hydrogen chloride and hydrogen fluoride react with the lime. This semi dry process was developed by Stadtwerke Düsseldorf so as to avoid the emergence of any pollutant wastewater. The resulting powdery lime compounds and other dust particles are separated in electrostatic precipitators. These substances are used as filling materials in the mining industry. The subsequent filtering with activated coke removes heavy metals and organic toxins from the flue gases. Alternatively, these days the activated coke is substituted by a mixture of sodium bicarbonate, i.e. baking powder, and a small amount of activated coke. This reduces the consumption of activated coke by one-fifth while achieving the same cleaning performance. The final stage of cleaning is conducted by catalysts, which transform nitrogen oxides (NOx) into harmless steam and nitrogen. 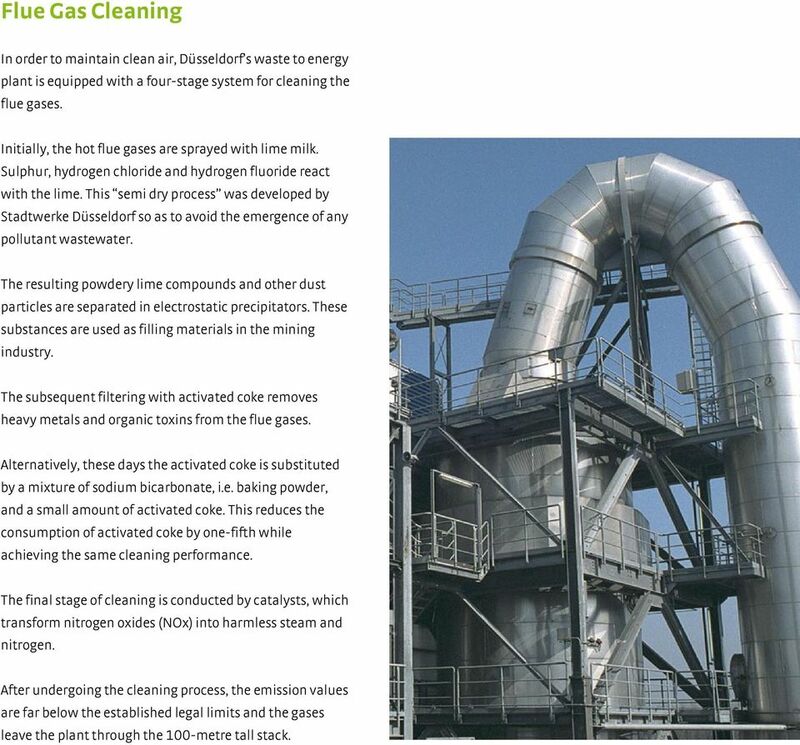 After undergoing the cleaning process, the emission values are far below the established legal limits and the gases leave the plant through the 100-metre tall stack. 10 Monitoring the Emissions Data Compliance with the legal provisions is continuously verified by means of data transmission to Düsseldorf s regional administration. An electronic indicator board (Flinger Broich, at the corner of Rosmarinstrasse) displays to Düsseldorf s citizens that the legal limits are being complied with at all times. Laboratory The delivered waste materials are examined at the waste to energy plant s laboratory. 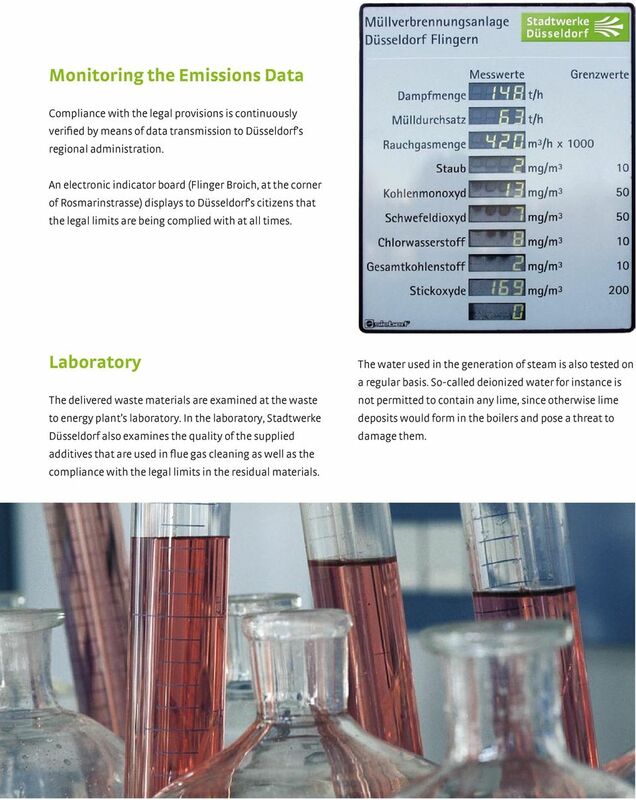 In the laboratory, Stadtwerke Düsseldorf also examines the quality of the supplied additives that are used in flue gas cleaning as well as the compliance with the legal limits in the residual materials. The water used in the generation of steam is also tested on a regular basis. So-called deionized water for instance is not permitted to contain any lime, since otherwise lime deposits would form in the boilers and pose a threat to damage them. SEATTLE STEAM COMPANY FREQUENTLY ASKED QUESTIONS What products/services does Seattle Steam provide? The company provides thermal energy (heat) produced at two central heating plants in downtown Seattle. INCINERATION of HAZARDOUS WASTE in a high T plant: a SUSTAINABLE TREATMENT? EXPERIMENT NO. 2. Aim: To study the construction and working of various boiler mountings and accessories. Westinghouse Plasma Corporation Plasma Gasification Facility Westinghouse Plasma has over 30 years of experience in research, development, testing, design and commercial use of proven plasma torch technology. RULE 400.2 BOILERS, PROCESS HEATERS AND STEAM GENERATORS (Adopted 02/23/2010) A. Applicability A.1 This rule limits emissions of oxides of nitrogen (NOx) from Boilers, Process Heaters, or Steam Generators. FAQ HOW WILL BIOMASS BE USED ON THE BCIT BURNABY CAMPUS? M.Sc. Matti Kivelä Power Plant Manager R&D Lahti Energia Oy P.O. Box 93 FIN-15141 Lahti Finland Tel. 358 3 823 3240 matti.kivela@lahtienergia.